E.ON’s revenue for the year ending September 2018 was estimated at $36.93bn. Image courtesy of Wiki05. Germany-based, privately owned international energy company E.ON’s revenues for the year ending September 2018 stood at $36.93bn. Its Energy Networks segment accounted for 29.5% of the total revenue during the period, followed by Customer Solutions 20%, and the Renewable segment 3.3%. The company’s Non-Core Business accounted for 4% of the total revenue. E.ON operates more than 5GW of renewable power plants worldwide. It also operates a nuclear power business in Germany through PreussenElektra. The European Commission (EC) approved the acquisition of E.ON and Innogy’s renewable businesses by RWE in February 2019. 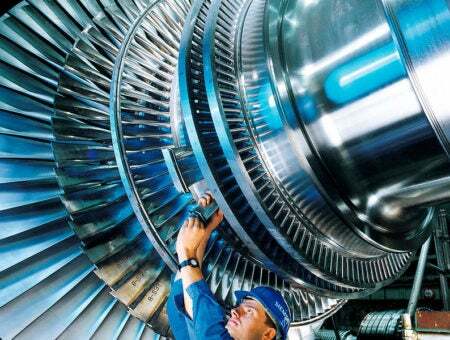 Siemens’ Power and Gas segment generated $14.13bn in revenue in 2018. Image courtesy of Siemens Pressebild. Siemens’ energy segments, including Power and Gas, Energy Management, and Siemens Gamesa Renewable Energy, contributed $14.13bn, $13.93bn, and $10.36bn respectively to its total consolidated revenue of $94.35bn in 2018. The Power and Gas segment, which provides products and solutions for the operation of fossil fuel and renewable power plants, witnessed a 14% decrease, while the total orders in this segment increased by 14%. The Energy Management segment engaged in the supply of power transmission and distribution products, reported a 5% increase in revenue, but a 10% decrease in orders. Siemens Gamesa Renewable Energy, which is engaged in the wind power business, reported a 5% decrease in revenue, but an 8% increase in orders. General Electric’s (GE) Power, Renewable Energy and Lighting segments contributed $38.5bn revenues in 2018. Image courtesy of EEJCC. General Electric’s (GE) three energy segments Power, Renewable Energy, and Lighting generated $38.5bn in revenues, accounting for 31.7% of the company’s total revenue of $121.6bn during the year. The three segments respectively contributed $27.3bn, $9.53bn, and $1.7bn to the company. The company’s revenue from the power segment decreased by 22%, whereas that from the lighting business dropped by 11%. Revenue from its renewable energy segment, however, increased by 4% during the year. The GE Power segment provides products and services related to energy production, while the GE Lighting segment develops lighting solutions. The GE Renewable Energy segment provides onshore and offshore wind turbines and blades, as well as hydropower solutions. Iberdrola’s net profit grew by 7.5% to $3.4bn in 2018. Image courtesy of mifl68. Spanish multinational electric utility company Iberdrola registered a 12.2% year-on-year revenue growth to $39.79bn in 2018. The company’s net profit grew by 7.5% to $3.4bn. Iberdrola’s net investment during the year reached $6bn with its transmission network business accounting for 46% of the investment, followed by the renewable segment (31%) and the power generation and supply segment (20%). Operating in Spain, US, Brazil, Mexico, and the UK, Iberdrola had more than 29GW of renewable energy installed capacity as of December 2018. Iberdrola Renovables Energía, ScottishPower Renewable Energy, Avangrid Renewables, and Iberdrola Renovables México are its major subsidiaries engaged in renewable power generation. Engie sells more than 7.3TWh of electricity a year. Image courtesy of Parus-Corax. French electric utility firm Engie reported a 1.7% year-on-year revenue growth to $68.8bn in 2018. The company’s power business accounted for more than 60% of its total revenue. The company’s annual electricity sales exceed 7.3TWh. Its revenues, excluding gas sales, was estimated at $48.8bn, based on the average gas price in Europe during the year. Engie is the biggest independent electricity producer in the world and generates more than 25GW of renewable energy a year, accounting for almost one-fifth of the global renewable energy generation. The company added 1.1GW of wind and solar capacity in 2018. Korea Electric Power Corporation’s (KEPCO) power generation business accounted for 68.1% of the Korean power market in 2018. Image courtesy of Redpenblue. Korea Electric Power Corporation (KEPCO) witnessed a 1.4% year-on-year revenue growth to $53.5bn in 2018. The company’s power sales volume increased to 530TWh, compared with 507TWh in 2017. With a total generation capacity of 81.15GW, KEPCO’s power generation business accounted for 68.1% of the Korean power market in 2018, while its transmission and distribution business accounted for 100% market share in the Korean power market. KEPCO’s power generation business is operated through six of its wholly owned subsidiaries namely KHNP, KOEN, KOMIPO, WP, KOSPO, and EWP. The other subsidiaries involved in plant maintenance and engineering service include KEPCO E&C and KEPCO KPS. Tokyo Electric Power Company (TEPCO) is Japan’s biggest power company. Image courtesy of Tokyo Electric Power Co.
Japan’s biggest power company Tokyo Electric Power Company (TEPCO) registered $55.36bn of revenue in the year ending December 2018. The company’s electricity sales volume during the period stood at 239.9TWh. Headquartered in Chiyoda, Tokyo, TEPCO focuses on power generation and distribution through 34 subsidiaries and 32 affiliates. TEPCO has three core operating segments, which include Fuel and Power (fuel and thermal power generation), Power Grid (general power transmission and distribution), and Energy Partner (electricity retail). EDF company operates 73 nuclear reactors globally. Image courtesy of Stefan Kühn. French electric utility company EDF’s revenue increased by 6.3% year-on-year to reach $77.8bn in 2018. The company’s power generation, supply, and regulated activities in France accounted for 61%, while the UK and Italian markets accounted for 13% and 12% of its revenue respectively. Its reactor business Framatome contributed 4.8%, while its renewable businesses Dalkia and EDF Renewables respectively contributed 6% and 2% of its revenue. The company operates 73 nuclear reactors and serves more than 35 million customers worldwide using 1.3 million kilometres of low and medium-voltage networks and 100,000km of high and very-high-voltage transmission networks. Enel distributed 485.4TWh of electricity on its network during 2018. Image courtesy of Enel Spa. Italian multinational energy company Enel’s revenue was up by 1.3% to $85.28bn in 2018. The company generated a total of 250.3TWh of electricity, but distributed 485.4TWh of electricity on its network during the year. The company’s total electricity sales amounted to 295.4TWh. Enel’s electricity sales outside Italy increased to 191.1TWh in 2018 compared to 181.6TWh in 2017. The company connected more than 3GW of renewable capacity to grids around the world in 2018. The State Grid Corporation of China is the world’s biggest power company by revenue. Image courtesy of Ermell. State-owned electric utility State Grid Corporation of China (SGCC) recorded a revenue of $347bn in 2018 to emerge as the world’s biggest power company. Established in 2002 and headquartered in Beijing, SGCC distributes electricity in 26 provinces, covering 88% of the national territory. It serves a population of more than 1.1 billion in China. The utility also owns and operates transmission assets in the Philippines, Australia, Portugal, Italy and Brazil. With 987,000km of transmission lines and 4,350GW of converting capacity, SGCC’s annual electricity sales exceed 3,874TWh.